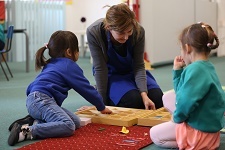 The Montessori classroom is a place where children are given an early start to their literacy skills. Good reading and writing skills stem from an environment rich in books, storytelling and full of opportunities for communication. Book corner and role play are part of every Montessori classroom. There is a clear link between early exposure to books in a supportive environment and later literacy; simple reading and storytelling form the basis of later reading, writing and good vocabulary. Montessori has its own unique reading scheme whereby the children are taught their alphabet phonetically using Sandpaper Letters. Once the child knows some sounds they began word building using objects and letters and this progresses through simple words to more complex ones. Children in a Montessori environment will be indirectly prepared for writing through preceding activities from other areas. For example the knobbed cylinders exercise from the Sensorial area requires the child to use the following skills – pincer grip, control of the hand, hand-eye coordination. Practical life activities encourage children to develop concentration which will be needed later when they are patiently forming their first letters. A first material introduced to children as preparation for writing is called “Insets for Design”; tracking these geometric shapes as many times as they wish will encourage children to hold the pencil correctly; it also refines the control and precision of movement. When children are ready to start writing they are shown the correct way of forming letters and given every opportunity to practice their new skill.